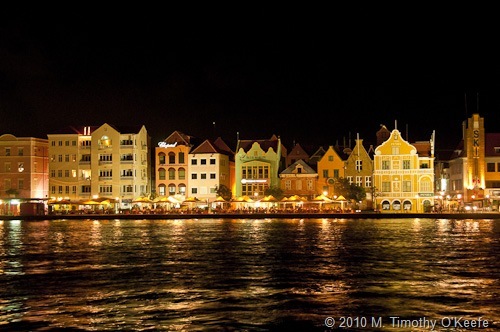 Willemstad, the capital of Curacao, has to be the prettiest port in all the Caribbean. 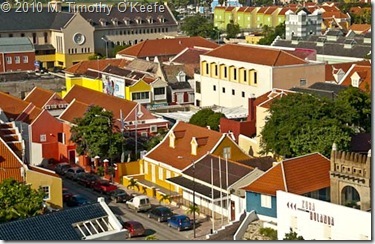 Dating back to 1634, it boasts hundreds of mansions and commercial buildings in the classic Dutch style. 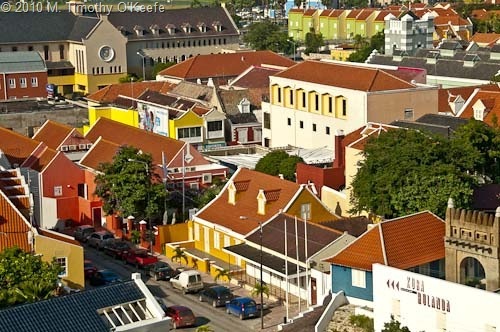 This distinctive architecture gives Willemstad considerable cultural and historical significance, which is why UNESCO in 1997 declared the entire city a World Heritage Site, one of few such designations in the Caribbean. 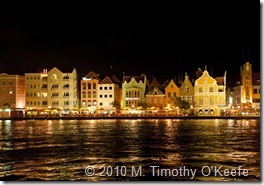 Background: St. Ana Bay divides the city of Willemstad into two distinct sections. 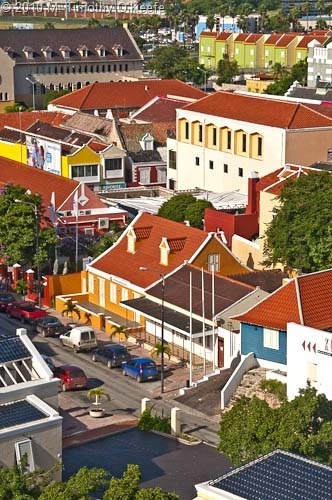 Punda, on Willemstad’s east back, is the older district and contains the government offices, the more upscale shopping and most of the best photo opportunities. The cruise ship dock is on the west bank, known as Otrobanda, which also has quite a few good photo subjects. Start from the ship’s top deck: This high vantage point gives you many unusual perspectives. In the morning, the light is on the Otrobanda side, which is at your feet thanks to the cruise dock location. Photograph the city from bow to aft, taking both wide angle and telephoto shots. 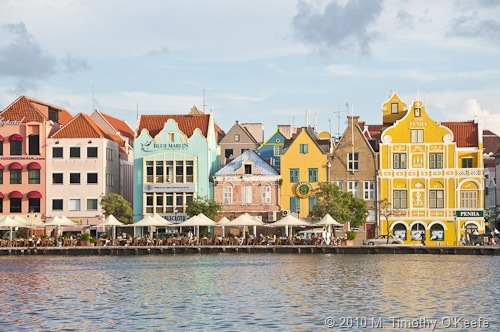 Most of Punda will be still in the shade, though you may have good sun on the famous floating market—also your first photo stop. 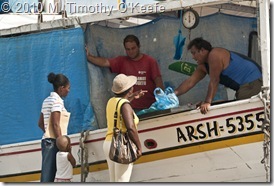 If the ferries are running, take one across St. Ana Bay to Punda. 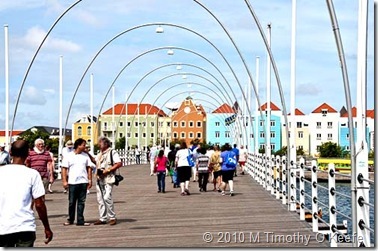 The Otrobanda ferry terminal is next to the cruise ship dock and the Punda ferry dock is just down from the floating market. Leave the more distant floating bridge until later. Floating Market This iconic landmark, near the customs house, consists of a line of wooden Venezuelan boats displaying the city’s freshest fish and produce. 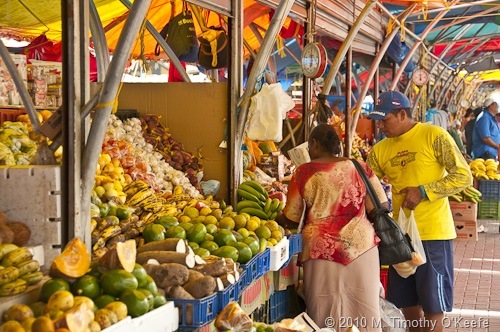 The market, open before daylight, is covered with mostly plastic tarps to protect the produce, the sellers and the shoppers from sun and rain. 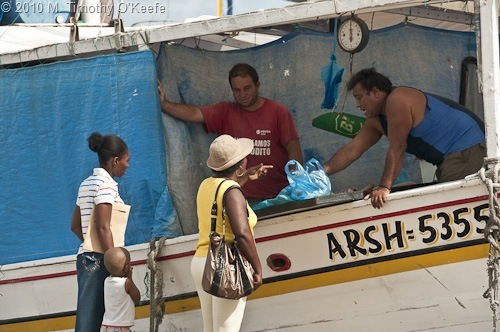 To begin, concentrate on what each boat is selling as possible photo subjects. Don’t overlook the people, too. Locals at the floating market are accustomed to photographers, yet it never hurts to ask. After reaching the last of the boats, take the bridge immediately on your left. This will allow you to use the morning sunlight, which is on the back of the boats, not on the produce side. This is a better view than you would expect, with lots of color and sometimes action, too, as men row small boats shuttling produce between boats. To take advantage of the sun when it does shine on the colorful exhibit of fruits and vegetables, return about two hours before sunset. You may have to wait a short while for the sun to get at the perfect slant but better to be early because tall buildings block the sunlight far too early. Scharloo: The bridge from which you photograph the floating market in the morning also leads to a neighborhood of wonderful old mansions in a section known as Scharloo, also part of the World Heritage Site designation. To be honest, I have photographed this area only in the afternoon since sunlight is on “the wedding cake” mansion only in the afternoon. There are equally good subjects morning subjects as well, though I can’t document them. If you have plenty of time, take the first road on the right you encounter. To be honest, the number of photo subjects on this walk are few. 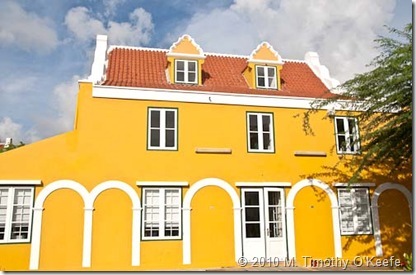 However, after a short walk you will reach a yellow mansion on the left I consider one of the best reconstructed buildings on the island (afternoon shot). 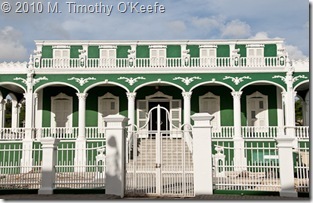 This street ends at a main thoroughfare where you’ll see some excellent architectural styles as well. 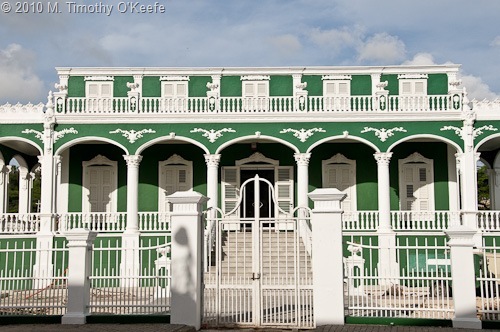 Which of these mansions is the “wedding cake?” The green one. Once you reach the main highway, go left; then take the first road on your left. 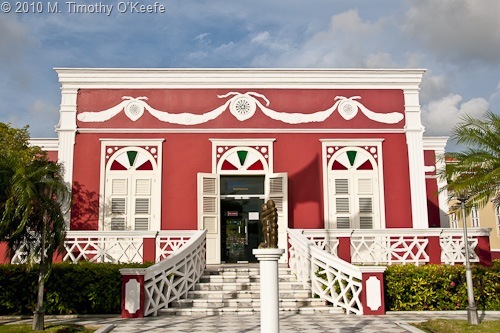 Among the first buildings you’ll encounter on this street is an oblong, elaborately decorated green and white building introduced to me by a tourist board rep as “the wedding cake.” You will find no sign designating it as such. On the Maasdam cruise, the building is undergoing some renovation; so no telling what it is being turned into or what it will be named. Continuing on this street, you’ll encounter old mansions in all the popular colors—purple, blue and yellow, all on the right. Those on the left have the morning sunlight. The first road this street intersects with will take you back to the floating market if you go left. But feel free to explore the rest of this relatively small district. 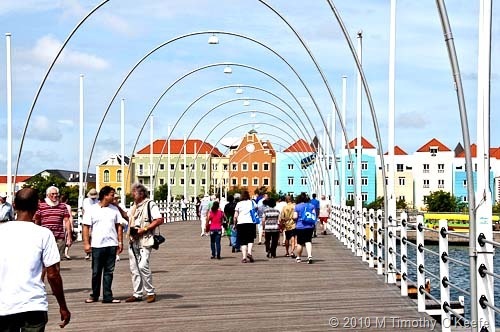 Queen Emma Bridge: Affectionately known as the “swinging old lady,” this floating pontoon bridge is the only route for pedestrians to cross the channel dividing Willemstad. The city uses a floating bridge instead of a permanent structure so cruise ships and huge oil tankers can transit in and out of St. Ana Bay. When a ship needs to enter or exit, the bridge disconnects from Punda and almost its entire length swings to the Otrobanda side. While it is quite a humbling sight to be at the waterfront when one of the huge tankers passes through, the prime location to capture the giant ship with Willemstad in the background is from your ship’s highest deck. But back to Queen Emma Bridge itself. Photograph this Caribbean one-of-a-kind throughout the day since the background will change from Otrobanda in the morning to Punda in the afternoon. When you walk its length, take varied horizontal and vertical images that include people as well. Also shoot the bridge on show to capture the side of it to show the series of pontoons that keep it afloat. You’ll notice electric lamps placed in the middle of the series of metal arches that line the bridge. These lights do not provide enough illumination for an interesting night-time photo subject compared to when the metal arches were wrapped with strands of seemingly brighter Christmas-type lights. Now, that was a picture worth taking. Maybe this new lighting system will be, too. I just didn’t have time to experiment and see the results. 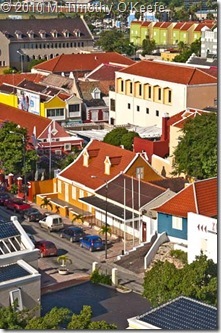 Punda waterfront: The waterfront’s main commercial street is the iconic image of Curacao. Its narrow but tall series of buildings were built by Dutch merchants who made built them so high because they served as offices, warehouses, stores and living quarters. 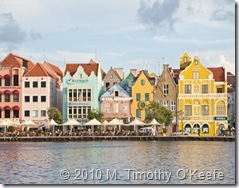 Each of the adjoining buildings this a different color, most in bright shades but some also surprisingly bland. 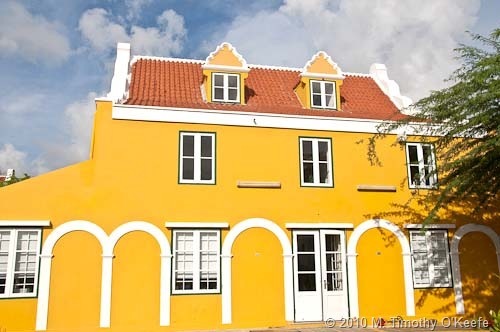 The best known is the bright yellow Penha building, definitely worth photographing as a single subject while on the Punda side. Best time to photograph the entire line of buildings is the afternoon, the later the better. Your best straight-on view is from the Otrobanda side. Be creative. Shoot horizontals and verticals. If you use a wide angle lens to capture all the buildings in a single frame, sky and water will dominate the picture and the buildings will look like miniatures. Now is the time to take advantage of your camera’s panorama mode. Or stitch together a series of close-in views for a panorama in Photoshop. On this 35-day voyage, the Maasdam does not leave until after dark. Unfortunately, the sun sets sooner than I expect and I miss the chance to shoot the Punda at twilight from the Otrobanda side. The lights on buildings are not as bright as the photo above indicates. I used a slow speed with a tripod. This is the one time that having a lot of water in the photo is a good thing since it reflects the lighted waterfront and makes the picture far more interesting. This is another good opportunity to make or stitch together a panorama. Finding other photo subjects: There are many more good picture opportunities on the Punda and Otrobanda sides to find on your own. Such as Punda’s Fort Amsterdam, worth visiting in morning and afternoon. And the fort at the mouth of St. Ana Bay on the Otrobanda side, both AM and PM. 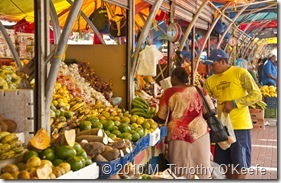 Finding unexpected and special locations is what travel photography is all about.